Be mesmerized by the dramatic surf. Relax to majestic sunsets. Hike along duned beaches. Wade in the Ten Mile River. Sip a glass of wine from a bluff-top perch. Refresh your mind, body, and soul in a charming redwood bungalow with stunning views from one end of the house to the other. Maximum Occupancy 6. Kids okay. NO pets. NO parties. Whale Rock is the perfect spot for a romantic getaway or a family vacation. Perched on a bluff along the Mendocino coast, Whale Rock offers both captivating natural beauty and an exciting outdoor playground for children and adults. Whale Rock is ten minutes north of Fort Bragg and only twenty minutes north of the village of Mendocino. The small city of Fort Bragg offers a full array of services, from excellent food markets to yoga classes to salmon fishing charters. The former lumber and commercial fishing community now features many fine restaurants, antique shops, and the Skunk Train, which offers a fun half-day excursion through the old redwood forests of Mendocino County. 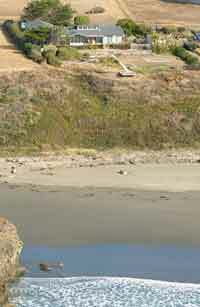 The alluring artist colony of Mendocino is a unique treasure of boutiques, art galleries, and gourmet dining spots. 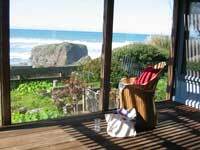 As much as the area offers, most visitors to Whale Rock would rather not leave at all, preferring to spend every possible minute on this blissful bluff on the Mendocino coast.